After finally managing to get hold of a guidebook we were on our way. Up past Gothenburg to Bosulän. On the drive in Lee was eyeing up every bit of rock he could see “there has got to be routes on that”, “that looks like something in the guidebook”, “look at the climbs on that one”, you could tell he was eager to get his boots on and some granite under his fingertips. I was feeling a little more subdued, after three days of solid driving climbing some trad for the first time in months wasn’t sounding that appealing. We headed to the campsite and after a quick back and forth I managed to get a receptionist that spoke better English than me. We picked a spot with a good view, electric hook-up and we were sorted. Time to head out to our first European climbing spot. 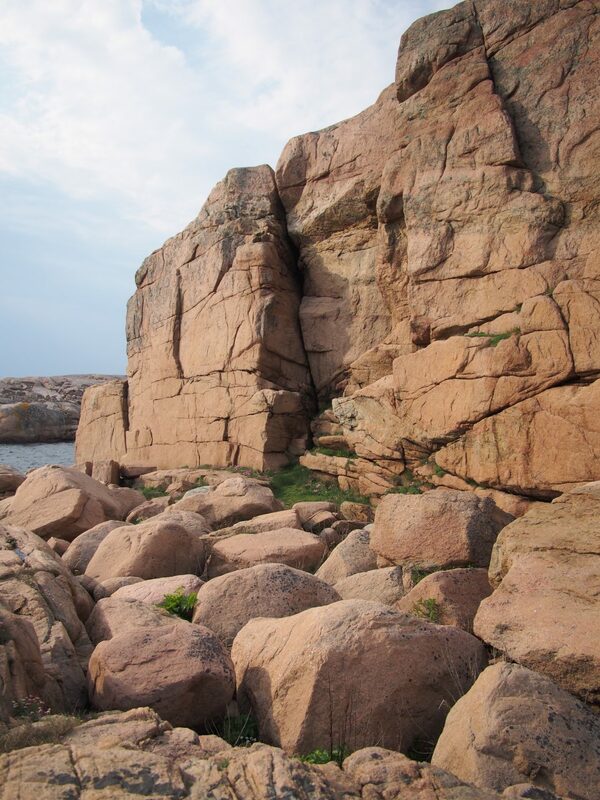 Lee decided on a little crag called Kleven, on an island to the south-west of the area, only a ten-minute drive away. The map and the directions seemed to contradict – so when we got to roughly the right area I followed the map, mistake one. After parking up and faffing with the bags we went for a wander down the harbour front. We came across the first crag, the climbing was a bit too hard for warm-ups on different rock and trad to boot, so we followed the map and wandered to the end of the jetty. No crag appeared. I checked the map again, it definitely should be this way. But then we checked the description. Should have parked further down. Oops, my bad. A quick head back to the car and we were sorted, a great footpath out along the cliffs led us to a little eight metre crag on a platform looking out to sea. 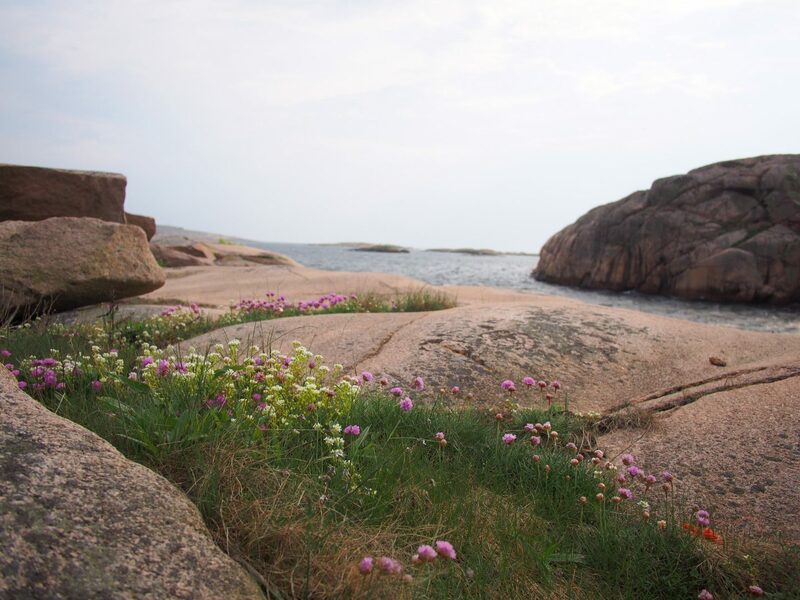 By the abundance of little flowers and grass patches on the rock we weren’t to be worried about the tide washing us out any time soon. Lee led a route first, confident and considered as always. The rock was a tad damp but he didn’t complain, instead commenting on the grippiness and texture of the rock. It was easy climbing steady with good gear placements, just what we needed to start the day. I had trouble with a pesky size 4 half way up. After struggling for what felt like an age, I shouted up that we’d have to ab it, and carried on. I got to the top and Lee quickly set about making an anchor. I scrambled back down and by the time I got there he was at the floor with the nut in hand, apparently I’d loosened it off so it took him no time at all. A light sea mist started to come in, but I thought I’d try to get one climb in. An attractive corner that looked like it would eat gear, and therefore be as safe as houses, was my target. I pottered up the start and got some gear in on the ledge. Now for the faff. I’m getting quite good at down climbing it turns out. I was up and down, putting one more bit of gear in, climbing down to the ledge, climb up one move and bit of gear further, all the way down. 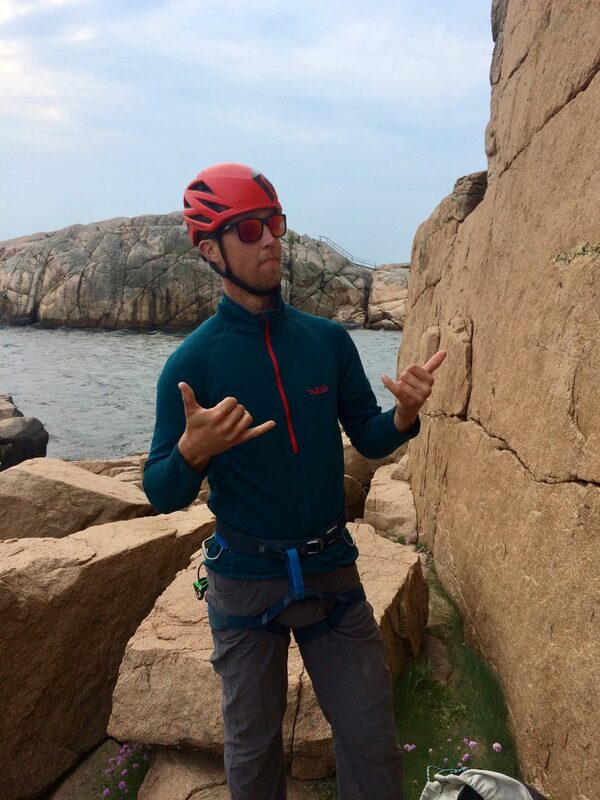 After a final freakout and – if I may – some super smooth technical down climbing moves (Lee – “it would have been less difficult just to finish the route”) I had psyched myself out, and handed the reigns over to Lee. He proceeded to cruise it in his trainers, well I had put a top rope on most of it I guess. Got to the top on second via some pully moves. Time to head back to the van for tea. Rock 1 Becky 0 Lee 2 – well it was just a warm up day. Hi Mo. Lee’s been really good at letting my drive, we’re doing about a 50/50 split at the moment (although I do give him the odd mild heart attack). It does feel a bit like a holiday but we’re definitely both struggling with what to do in the downtime. We don’t know what to do with ourselves. As I’m sure you can imagine the van has been rearranged a fair few times already. The blog is a bit behind, just coming back across Norway now, but I’ll try and update it when I can! Your writing style is really good, it really sounds like you. Enjoying it very much: how did you get Lee to wear a lid? Thanks! The One and only time he’s worn it so far. “I’ve brought it all this way…” was the comment at the time. Too tired on an evening to write at the moment. Will get back on it soon for more posts! Liked your Slate one btw!